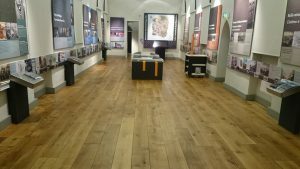 There is always a strong demand for alternatives to plain plank flooring, but many of the choices made by designers look lovely in a showroom but are totally impractical in the real world. One of the alternatives showing increasing popularity is the brushed and oiled flooring look which is actually a very practical floor but a quick internet search shows a serious lack of proper information on what it actually is. As more and more wood floor suppliers fall over themselves to dominate the market they often either deliberately write confusing or misleading articles or do so out of ignorance. So far I have led you to believe this look is only available on new flooring and those internet searches I mentioned earlier show how suppliers will try to confuse you into thinking it is only available on semi-solid or engineered floors, after all, that’s what they want to sell. Happily, that isn’t the case and whilst it is difficult for traditional floor sanding companies to create this look uniformly across a wooden floor the Ultimate Floor Sanding Company has developed a unique technique that can be used on existing flooring. Our diamond based process can be tailored to create the look you want by using differing grits and when used in combination with “water popping” and staining a truly unique look and finish can be created for your home.